Eight times I actually did die. And then eight times they brought me back. I had made up my mind and body and soul to go. They didn’t accept my answer and came up with their own: stay. I am on my ninth life. This record – here in this leftover blog – is not that. Not even a reflection of that, nor a shadow of it. But as I make the turn, I will reopen the windows on this room and air it out and spend some time in here again. Bear with me as I dust the shelves and throw out old receipts and devices I no longer use and cords that have been tangled way too long. Eventually, everything here will work again. Eventually, everything here will again have its place. Eventually, everything here will be worth something again. I don’t believe in waste. I don’t believe in chance. I never stopped believing in what was meant, only in thinking anyone else had to believe the same, or ever once did. And I have never stopped believing in love. That won’t change, no matter how many more times I manage to die. Closer to 12 times, we think. Times that I died, that is. Within the first year of recuperation – several months after making this post – I was in the pool talking about the experience with Tim, who had been on the scene and had known about as much about the situation as anyone other than my chief doctor. When I mentioned having coded 8 times, Tim’s eyes unexpectedly went wide in a startled impulse. Eight? No, he shook his head vigorously. More, he said. Many more, he said. 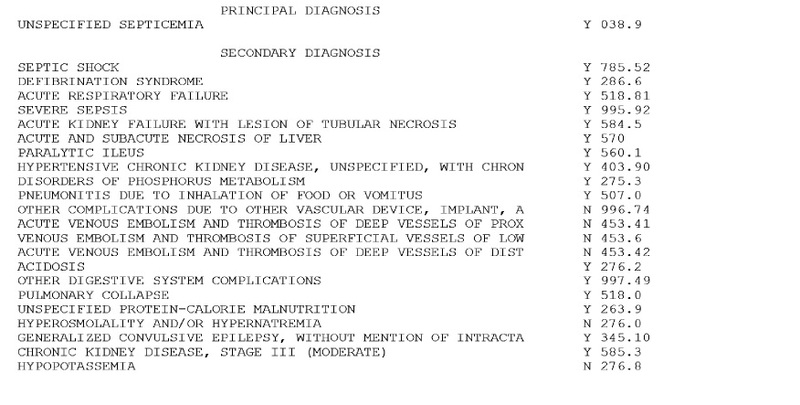 Well, the official paperwork given to me by the hospital includes only 5 separate code records. But then again, the doctors and nurses do seem to be counting separate incidents when CPR is necessitated, with intervening periods during which my heart and breathing did ok on their own. Apparently, some – perhaps all – of the code records include multiple events. For instance, one code record seems to have been filed for the entire initial encounter, although SuziQ’s recollection had me requiring CPR for at least two distinct incidents during that encounter, with an interval in the middle of that encounter during which I was alive enough for the doctor to exit my room to speak with SuziQ. And I have heard stories of incidents that don’t even seem to have been documented in the hospital records. Notably, for instance, when I was to have special tests done, and the head doctor took the exceptional step of accompanying me because he was uncertain I might survive the trip down the hall, then I’m told I coded during that time; yet I find no hospital record to match. So since that convo with Tim, I’ve been more vague on the number, simply estimating that I died something more than a dozen times. From what Tim told me, even that number is a low estimate. The exact number doesn’t count so much, as does the fact that I spent a week on the very edge of death. I kept coding so often because even when I was alive, my body was dying. Five times, eight times, twelve times, twenty times or a hundred or more, it was as though I died on every breath for a whole week. On most of those deaths, I came back on my own, but then I’d turn around and die all over again. But on many of those deaths – so many that they stopped counting – I needed the help of others to keep me around.